So I thought, this will bring all of us together. At the time, I was CEO of a small software company in Reston, Virginia. I still had my apartment in Brooklyn, NY and I was commuting back and forth. On that particular week, I had decided to work from home and make the meetings I had scheduled in Manhattan. As was my typical routine, I woke up and then went up the corner to buy a copy of the USA Today newspaper. I came home, poured the coffee, and then it happened. I first heard about it on CNBC. They speculated that a plane had run into the World Trade Center by accident. I thought to myself no way. Soon enough another plane ran into the WTC. The news of the Pentagon came over the airwaves. We were under attack. I was immediately worried. My girlfriend at the time worked at the World Financial Center. Right across the Westside Highway from the World Trade center. Her office faced the WTC. I couldn't contact her, she couldn't contact me. The phone lines were jammed. You could not call into Manhattan. She couldn't call out. As it turned out, it was a miracle. She had stayed home waiting for a plumber to arrive at her home. He was late heading out to work. She did take the train from Long Island, and she was on her usual subway. The subway she exited right under the WTC every work day. She should have been going through the WTC shortly before, or during the first plane attack. She wasn't. Her subway stopped one stop before the WTC at Chambers street. They had already stopped the subway system. She came out of the subway tunnel with all the other passengers that had no idea what was going on. They looked up. They thought it was a fire. She made a first good decision. Instead of standing there, she started to walk away. As it turned out she decided to get as far away as possible. She decided to go to a friends office near Times Square. She made another good decision. She went into a sporting goods store and bought a pair of walking shoes. It is a long long walk. Finally, she ran into a friend who was also walking away. The friends phone was working. She called me and told me she was alive. I called her family. I told her to keep on walking. A few hours went by, she called and told me she was safe and sound. Unfortunately, the trains were not running and the subway was not running. Finally, the subways came back in service. There was a subway line running to Brooklyn. Not the one that came right near where I lived, but close enough. She decided to go for it. After a while she called crying, she couldn't go down the steps to the subway. A guy came along and asked what was happening. He told her, come with me I am going to Brooklyn. He held her hand. Meanwhile, I walked over to the subway to meet her.Something was wrong. She didn't come. I headed back home. I decided to stand on my corner. Finally, I noticed her coming from an unexpected direction. I ran down to meet her. She explained to me that she had to get of the subway because the "guy" was getting off. She walked from there. By then I knew it was going to be bad. I had friends at Cantor, Fitzgerald. We also had a large group of people from Bear Stearns that had started their own firm in the WTC. Sandler, O'Niel. 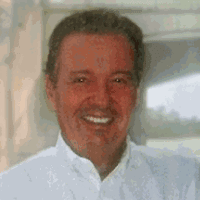 Herman Sandler was the founding partner. Most of them made it out. Herman did not. He stayed behind to help others. Over the following days my phone continued to ring. Didn't make it. Didn't make it. Didn't make it. Didn't make it. I think every single person that worked in Manhattan knew someone that -- Didn't make it. As it turns out you could see the World Trade center from the deck on my apartment. It was very close, I lived just on the opposite side of the East River from Manhattan. I had a birds eye view of the WTC. I had to look. After a while, I finally noticed it was snowing. Not snow, concrete. I looked down, my deck was covered, the concrete was starting to accumulate. I went inside and looked at myself. My hair was full of concrete snow. I immediately closed my doors and windows. Yikes. I hope that wasn't asbestos. After a while my curiosity got the best of me. I had to go out and look again. It was gone. There was lots of black smoke going up, but the building was gone. To be honest, this was impossible to comprehend at the time. Ii only got worse when the second building went down. I could go own and on. Two things that still stick out in my mind. The following May (8 months later), I was driving on Northern Boulevard in Manhasset. I looked over at a big church. There they were the policeman and fireman in full uniform. 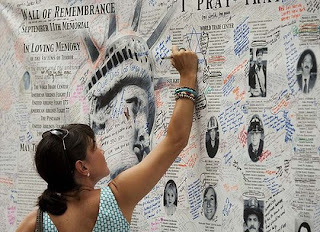 The funerals for the victims of the WTC attack went on and on and on. I thought to myself, I am going to avoid this intersection for a while. The most eerie thing after the fact. When you drive into New York from New Jersey and when you are heading to the Holland Tunnel you would see the twin towers. After September 11 and the first time I made that drive, I looked up and the towers were gone. I was filled with an immense feeling of sadness. Every time I made that drive in, sadness. I had learned that while in Manhattan or Brooklyn not to look for the towers. But, you could not avoid looking while driving in. I left New York in 2003, since then I have not made that drive. I know exactly how I am going to feel the next time it happens. It is not easy to write about those days. Didn't make it. Didn't make it. Didn't make it. As some of you know, I am a very positive guy. Not long after the 911 attack I started thinking and telling my friends, some good is going to come out of this after all. We will honor those who were lost by banding together. We will come together and make America a better place for everyone. Isn't this what happened after World War II? I know as a kid Memorial Day and July 4th were very special days. That is what I thought at the time. It is now ten years later and they have not yet rebuilt the 'Trade Centers', what the hell is wrong with us?